I have been having an affair. For years now I have been going behind the back of my first true love, for the dirty, grimy, and greasy mistress. The shame I felt over the last several years has finally culminated into this article, this declaration of my love/hate relationship. I love mediocre food. After a long week of cooking every meal, maybe going out to a good restaurant, and eating food that is generally good, my relationship with food goes dark and I reach for a distraction. It’s hard to explain exactly why, but sometimes I feel the undeniable pull of a gas station hotdog or an assortment of greasy Waffle House treats. I know that they are bad for me, I know that they are unhealthy, I know that the enjoyment I’ll feel will always be followed by guilt, but sometimes I just can’t help myself. What is it about mediocre food that pulls us in? Why do we feel the need to drive late night to eat a taco we never would have eaten only hours earlier? The first thing I think of is the need for time away from the world. The most common time I find myself in a booth at the local “I don’t know how this place stays in business” diner is late at night after a long drive to clear my head. My body craves for more time to think and sort out my life, but needs to have a low impact activity. Enter: Diner. After parking in that pseudo leather seat and placing my order I know that I won’t be bothered. The restaurant is empty at this time of night and makes me wonder why exactly they stay open 24 hours a day. Maybe it’s done as a service to the drunk and the deep in thought. After the meal my mind has been made up and I am ready to once again face the real world. That pancake, bacon, and egg combo is completely forgotten, as if I never ate it in the first place. But I am able to return home and sleep in peace, my mind clear and my stomach full. Next, I think of comfort. Many of the foods we eat on a regular basis have some sort of tie to our past. Here’s an easy example: Kraft Macaroni & Cheese. While mixing the concoction over a heated stove you know for a fact that you are getting a sub-par meal. The pasta is low quality, the amount of butter seems so hefty you have to read the instructions a second time, and the addition of neon orange powdered cheese are all pretty big indicators of what is to come. 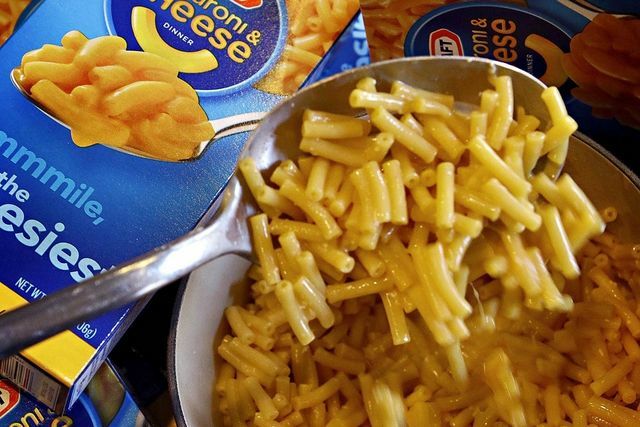 Yet it is rare to find someone who ate mac & cheese as a child who doesn’t still open a blue box from time to time. Why? Our memories of better times, when things were simple and many of your actions were inconsequential, are tied to the contents of that box. When a time machine can be made out of pasta, milk, butter, and dehydrated cheese, the appeal to go back is just too strong for most of us to resist. Sure we may have now improved upon the recipe, higher quality cheese, better pasta, baking to form a nice browned crust on top, but the draw of the original is always there. Lastly, sometimes the mood is just right. Drunk food is starting to become an industry all its own. Food carts and small stands are staying open late to give victims of last call a place to sop up the alcohol and relive the adventures that were had in the hours prior. Sometimes you just feel like you need to eat, and when you NEED to eat the quality of food takes a back seat. In fact, I believe that many people have moments when they would rather have a greasy burger over a medium rare steak. For some of us the sensation happens more than others, but we all have that same feeling. When the urge hits me, greasy tacos or a spicy sausage are my weapons of choice in a war against ending the night on a low note. I can’t complain, so far I have a 100% success rate. So we enjoy mediocre food over great food from time to time, that’s nothing to be ashamed of. If you need to work out some thoughts, go back to a simpler time, or end your night with a bang, run out and grab whatever sounds good. Sometimes we all need a little affair in our culinary relationships. What is your favorite guilty pleasure food? Let us know in the comments! Reblogged this on Vegan Pastry arts.